I need help!!! Does anyone recognize this three layer set of Anchor stones? I think it is KK-AF, but I have not seen the stones or their sizes. TheGreen Gate (Das grüne Tor) was built by Dieter Wellmann, Germany. This famous gate, from the high Renaissance, is found in Danzig, where Dieter was born. Of course, today, Danzig is in Poland. 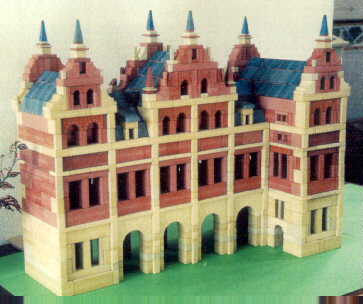 The Green Gate was rebuilt in its original style by the Poles after the war, but Dieter was able to build this model from pre-war pictures. The builder's page does not feature a builder this month. Instead it answers the question 'how can I get the stones I want?'. Answer: Make them. Both Ben Strasters and Ernst Offerman make stone, as do others such as Leo Coffeng. Their techniques are different. Ben does not sell stones, but Ernst will make them to order. On my own page is a repeat of my very first posting -- Monticello. Of course, Monticello is the most famous building in Charlottesville. But, as you will see, it is a quite modest building. Sets and puzzles are being produced again! The quality is high. I urge people interested in starting Anchor building, and those who want to provide their educational benefits to their children, to consider buying new puzzles and sets. I also have available a limited selection of old sets, including a new set and some special prices. Anchor Stone Building Sets are great presents, and the supplement sets make wonderful follow up gifts. These new sets recently won the 1997 Parents' Choice Gold Medal. In 1999, the Anchor sets won the National Parenting Publications Award. For an 1880 toy to win in 1997 says a lot about the quality of these sets and Anchor in general. These sets are a perfect supplement to computers. The CVA has published its Stone Catalog, which covers all of the stone shapes Richter made, plus shapes made by other innovators. Metal parts and most other accessories are included in the catalog. The contents of the sets are also listed. The cost of the catalog sheets (European size paper, intended for loose leaf use) is f 40, plus postage costs, in Europe. I bought four copies at the recent spring meeting, along with European four hole binders. All of them are already gone. The cost, including postage, was $40. I brought back six in November, but without the binders, but they are all gone now. All Anchor people need, and will want, a copy. Web Page Notes: Most subpages do not change from month to month. I will try to remember to add the note "(new)" after those subpages which have undergone major changes recently. The "builder's page" and "my page" are revised every month. A few people have asked me to number the "issues" of the Anchor page. Well, they started in August, 1996, (with Vol. 1, # 8, to keep the number of the month the same as the issue's number). The number of this "issue" is shown at the top of this page. I can make a CD-ROM of the old pages for anyone who wants it. CD-ROMs are so cheap now that the only real cost is postage. For the month of February, 2000. If there is interest, I will add a full page with more information. It is interesting. For example: Altavista contimues to be the most important referring web site, except for eBay while I was selling some (new) sets. Yahoo is second. But recently google.com has become a very important search engine referring site. If you have not tried google.com, I suggest that you give it a try. You will like it. Another very important referring site is johnrausch.com, the puzzle web site. The browsers used are, in order of popularity, Netscape, Internet Explorer and AOL. From the first appearance of the Anchor home page, August 30, 1996, there has been a slow but steady increase in the number of people accessing it. This site has been updated every month since August, 1996.